First, I want to say that I blog because of Jesus Christ. I wish to honour Him in all that I say and all that I do. I have always maintained that this blog is an extension of my Priestly Vocation. I am a Priest who blogs, not the other way around. I cannot ignore the plain precepts of Scripture: “Let the peace of Christ rule in your hearts, since as members of one body you were called to peace. And be thankful.” (Col 3:15). Secondly, the blog started off as a blog focussing on Biblical Archaeology. I love the Holy Land and the riches of the material remains that are such an affirmation to our Biblical exegesis. I am in the planning process of pursuing a MA in the subject. I had most of a dissertation more-or-less stuck together a couple of years ago when a gang of armed robbers made off with my laptop (info not backed up – my fault) while I was visiting at the Bishop’s (Michael Gill) residence. My loss was not as great as his, but I haven’t quite been able to put the paper back together again. I must focus more on that than the blog… I think. The blog moved away from that subject into the areas of Anglican / Catholic / Ordinariate Church news reporting and reflection. With that came all the Church politics, and as the late Bishop Trevor Rhodes put it: ‘Churchianity and not Christianity’. Here I don’t mind wading in, but it is exhausting being surrounded by those who think that their particular liturgical rite is the only valid expression or way of worshipping a crucified Jewish Rabbi; and that the rest (those who use a differing Prayer Book or Bible Version) are all lost revisionists doomed to hell. One of my favourite verses in the Bible is Philippians 3:8, “What is more, I consider everything a loss compared to the surpassing greatness of knowing Christ Jesus my Lord, for whose sake I have lost all things. I consider them rubbish, that I may gain Christ”. The blog does not define me. I am the Rector of a busy Parish. I am an Emergency Service Chaplain. They call me when people are lying on the road with their heads 300 meters removed from their bodies, when people want to kill themselves, or when they have, and that in front of others. It’s a world filled with pain, trauma, death and grief. And when they call you, you know it is for the sole reason that someone is needed to make sense of the senseless, to visit that place where life, precious life, has been maimed or taken. Here, it makes no difference if you’re an Anglican, Catholic, Baptist, Atheist, or Muslim. Here, it is only the love of Christ that will make a difference – when you point people to the One who can and will be a rock on which to stand when everything else around you is falling apart… He who loved us so much, that He laid down His life for us (John 15:13). God has further blessed me with a wife, a 12-year-old son and a 9-year-old daughter. I never mention them, but that is only to protect them from all of this. So know that I have mentioned them now, here, for the first, and last, time. It would seem that now with the closing down of the Anglo-Catholic blog, and before that, the English Catholic, the ‘trolls’ (or ‘ghouls’ as Fr Chadwick calls them) have been ‘roaming around like roaring lions, looking for someone to devour’ (1 Peter 5:8). Some have chosen to settle here. I want to say to them, today, categorically: You are not welcome! So I have determined to start to do some serious policing of the comments section. If you are here for gossip-mongering, brawling, sensation, badmouthing others and the like, then you are in the wrong place. Over the years, many before you have come and gone. I invite you to do the same. If you are here to build, for edification, for being touched by the mercy, grace and goodness of God, and yes, for some honest, serious and scholarly theological and ecclesiological debate, debate that is both mutual and charitable, then you are more than welcome. If you are unsure of the comments policy of the blog, click here. I have said all these things because I’m not happy with the direction that the blog is taking nor am I happy with the reasons (and intentions) that some people seem to have in coming here. Again, this blog is for edification and the furtherment of God’s Kingdom on earth. Or, perhaps, as Pope Benedict so wisely and beautifully put it, when encouraging his own Priests to blog, ‘to give a soul to the Internet’s incessant flow of communication’. If I can make a small difference for Jesus in the great big world of cyberspace, then I am happy. It is yet another means and medium for proclaiming the Good News. I expect that some out there may be disappointed in what I have just said. Do you know that this blog gets just on 2000 hits (that’s visits) daily? That figure may dwindle and fall after this announcement, but that’s okay too. I’m not in it for stats. And I’m most certainly not going to let things degenerate to a point where sin is more pronounced than holiness, where more darkness is emitted here than light. I may have to change of the content / subject matter, because Fr Smuts’ blog will not be turned into the next Continuing Anglican soap opera box, or the hottest place to come to when you’re looking for the next titbit of scandal. I must in conclusion, also thank my Bishop, Michael Gill, for guiding me (and my thinking) in these matters. I can say that I’m really blessed to have his close, godly and prayerful Episcopal oversight. Indeed, ‘… let your light shine before men, that they may see your good deeds and praise your Father in heaven’ (Matthew 5:16). PS. It’s just before midnight here in South Africa so please do forgive any typos, and right now, I’m off to bed. I’ll read over all this again tomorrow. Sydney’s Anglican Church has been criticised after changing the marriage ceremony to include a vow by the wife to “submit” to her husband – a pledge likened by critics to “reading Fifty Shades of Grey”. The Archbishop of Sydney, Peter Jensen, known as one of the world’s most conservative Anglican bishops, defended the new vow as an attempt to combat the destructive rise of egalitarianism and individualism. He said the vow was “not an invitation to bossiness, let alone abuse”. “In the last three or four decades a certain egalitarianism has crept into society and the way people think and I understand that’s the reigning philosophy,” he told ABC television. The new ceremony, expected to be approved by the diocese of Sydney at its synod in October, requires the minister to ask the bride: “Will you honour and submit to him, as the church submits to Christ?”. The bride then pledges “to love and submit” to her husband. Though the church will allow couples to choose a vow which does not include the controversial pledge, the new wording has already been used in some ceremonies. Stephanie Judd, 26, a Christian studies teacher, opted for the new vow at her wedding in January. “The husband’s love is one of sacrificial love, and to submit to that kind of love is not oppressive, but is actually a joy and a great freedom,” she told the Sydney Morning Herald. But the new vow triggered furious public criticism and prompted questions about its legality because it had not been approved by the church’s national governing body. The Sydney diocese is notorious for its staunch conservatism and does not allow the full ordination of women. “People criticise the Sydney Anglicans for being out of touch, so how wonderful to see the success of Fifty Shades of Grey being so rapidly reflected in the service,” wrote Richard Glover, a Fairfax Media columnist. The Holy Land is the setting for almost all of the Bible. Being in the Holy Land, then, is to be immersed in Scripture. GÜNTHER SIMMERMACHER explains the Fifth Gospel. The Holy Land, scene of most great events in the Bible, is sometimes referred to as the “Fifth Gospel”. It is a most evocative term, with the obvious caveat that one does not need to know this supplementary gospel to know, understand,love and live the other four. Jesus the Redeemer and his apostles, and before them the prophets and kings of the Old Testament, walked on the soil of the Holy Land, breathed its air, ate its fruits. When the visitor to the Sea of Galilee – which is not a sea but a fairly compact lake – takes the opportunity to eat the tilapia zilli (or St Peter’s) fish, they are eating what Jesus ate, and what in his famous miracle he multiplied to feed the multitudes. The Fifth Gospel is a wonderful guide to what we read in Matthew, Mark, Luke and John, in the Acts, and in the Old Testament. Knowing the context in which the events in the gospels took place brings them alive in a very special way. As we look in the faces of the local Palestinians, we can in our mind cast the characters in the gospels. The old man drinking his Turkish coffee in Nazareth could be Joseph. The young teenage girl hawking souvenirs in Cana could be Mary. The group of thirtysomethings who animatedly discuss the latest news in Bethlehem could be the disciples. And Jesus? Well, he certainly was not the northern European fellow with blow-dried blond hair of some depictions! When the gospels report about Jesus coming to the town of Capernaum, they do not give us much information about the place. The Fifth Gospel – being in the Holy Land or reading about it – fills in the gaps. Capernaum was a fishing town of some wealth, thanks to its location on the strategically important Via Maris trade route, which stretched from Egypt to Damascus. Capernaum and other towns in the vicinity, such as Magdala, made brisk trade in exporting fish products to the rest of the Roman Empire. So, the Fifth Gospel teaches us that when Jesus invited Simon Peter and his fellow fishermen to join him, he wasn’t picking up some chancers from the boondocks, but selected quite successful business people in what was an important town in Galilee. In Capernaum, as in many places in the Holy Land, we can make a physical connection with Jesus. Archaeologists have found what they are certain is Peter’s house. This is not the stuff of gullible pious legend, but the fruit of serious academic inquest. The remains of a fourth-century synagogue in Capernaum built on the black basalt foundations of the synagogue in which Jesus most probably preached and healed (Jn 6:30-59). 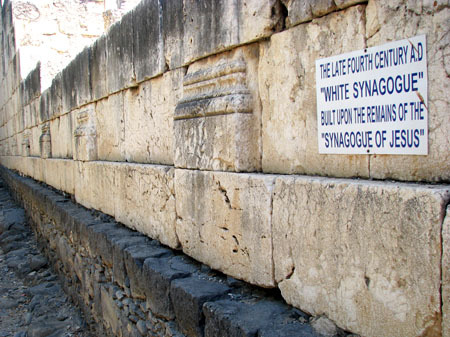 The same archaeologists have also identified the first-century foundation of what probably was Capernaum’s only synagogue. In both places we can locate the historical, physical Jesus. The Fifth Gospel also communicates how small the area of Jesus’ ministry really was. Most of it took place in an area that is smaller than northern Johannesburg. Occasionally Jesus and his disciples would move further away. One such key excursion was to a place called Caesarea Philippi, along the Golan Heights in the north of Israel, about 40km from the Sea of Galilee. There Jesus revealed to the disciples his mission. He asked them who the public thought he was – the public was hopelessly off the mark – and then he asked: ‘But you, who do you say I am?’ Peter got it right: ‘The Christ of God’ (Lk 9:18-27). What the gospels don’t tell us, perhaps because the original audience knew it, is that at Caesarea Philippi there was a huge pagan temple dedicated to the god Pan. In fact, Jesus might have known the place as Caesarea Paneas, which is how the first-century Jewish historian Josephus Flavius referred to it. When we know about the temple to Pan at Caesarea Philippi, the setting of Jesus’ big revelation assumes a new symbolism. Pan, god of nature and of shepherds, is now obsolete, because there is a greater shepherd who by rising again will show himself to be the Master of all nature. The symbolism doesn’t end there: Paneas is also the region of the two largest springs of the Jordan, the Banias and Dan springs. So it is at the springs of the life-giving river, the one in which he was baptised by his cousin John, that Jesus reveals his mission as the spring of the new life. When we read about the pregnant Mary and Joseph travelling from Nazareth to Bethlehem, or about Jesus going from Galilee to Jerusalem, the gospels tell us very little about the conditions, distance and terrain. The Fifth Gospel reveals that such journeys must have been unpleasant and dangerous. The terrain is mainly desert – not sandy like the Sahara, but rocky and mountainous. Because it was so desolate, it was brimming with bandits, especially during the pilgrimage seasons, when Jews were required to come to the Temple in Jerusalem. When Jesus tells the parable of the Good Samaritan, he refers to a specific route: the road from Jerusalem to Jericho. This is wilderness territory. The wilderness in which Jesus spent 40 days and nights after his baptism. 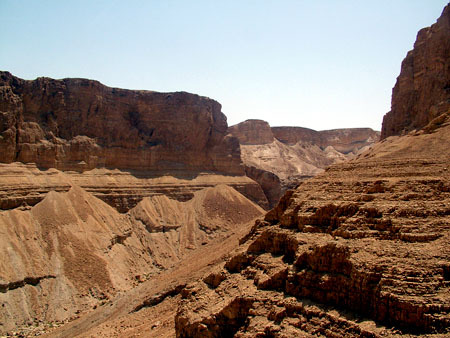 Jesus and the apostles traversed this kind of terrain when travelling to Jerusalem. Seeing the actual terrain deepened Dr King’s understanding of the parable which he already knew so well. Knowing the Fifth Gospel is particularly helpful in making sense of the narratives set in Jerusalem. Unlike Galilee, Jesus would not recognise Jerusalem today, though he would know some structures that have been preserved intact from his time, such as the Tomb of Hezekiah at the foot of the Mount of Olives, to the east of the OId City. He might not care to remember a flight of steps on Mount Zion, to the south of the OId City, which still exists. But there is no doubt that Jesus walked on these actual steps, which are adjacent to the church of St Peter in Gallicantu, which stands on what might have been the palace of the high priest Josephus Caiaphas. Jesus would have taken these steps on his way to and from the Last Supper and on other visits to Mount Zion. And he would have been led up these steps in captivity, after his arrest in the Garden of Gethsemane, on the foot of the Mount of OIives. Of course, Our Lady and the apostles would have walked on these same steps. And that is the tantalising beauty of the Fifth Gospel: finding that physical connection with Jesus, with Mary, with the apostles. Seeing the house where Peter lived, the place where Mary drew water in Nazareth’s only well, the waters of the lake on which so much happened, or touching the place where Jesus was crucified – not as randomly appointed sites of irrational piety, but as places which historical and archaeological inquest confirms as almost definitely accurate. The historical accuracy of many other places in the Holy Land remains subject to examination, and a few are doubtless randomly chosen. But even that does not matter much, because a pilgrimage is firstly a journey of faith. 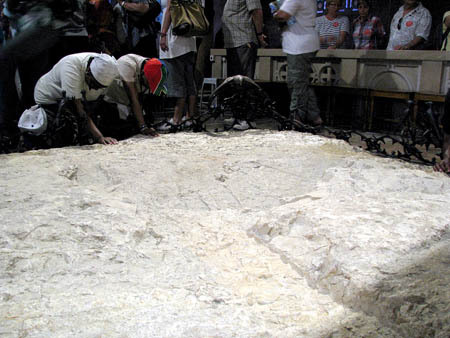 Pilgrims pray on the Rock of the Agony in the church of All Nations, on which Jesus is said to have prayed in the Garden of Gethsemane before his arrest. Next to the Garden of Gethsemane – in Jesus’ time an expansive olive grove, but now a small garden with a few olive trees that have regenerated over 2300 years – is the church of All Nations, a striking structure built from 1919-24. Inside the church, below the altar, is the white Rock of the Agony that is reputed to be the stone on which Jesus sat as he prayed the desperate plea to be spared his dreadful fate. It is not important whether this is the actual rock. Even it isn’t, Our Lord bared his soul, with all its human fear, on a rock like it at a nearby spot. More than in any other place in the Holy Land – or, perhaps, anywhere in the world – it is here that Christians connect with their own torments and fears, and those of loved ones. In places like the church of All Nations, the Fifth Gospel becomes an inextricable part of the pilgrim’s faith life, in ways even the four traditional gospels do not. 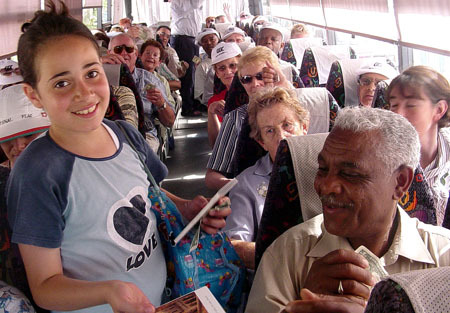 Günther Simmermacher’s book The Holy Land Trek is expected to be published in October 2012. So, Have You Offended Anyone Yet? OK, today’s question is this: have you managed to offend someone lately? And if not, why not? No, I am not being a smart-aleck here. These are actually legitimate questions. You see, here is a truism you can bank on: if you proclaim truth in the public arena, you will cause offence. It is that simple. -If you say marriage should only be between a man and a woman, you will offend homosexuals and their supporters. -If you say killing unborn babies is wrong, you will offend those who are pro-abortion. -If you say harmful drugs should remain illicit, you will offend the pro-drug legalisation crowd. -If you say that God exists, you will offend all sorts of angry atheists. -If you say Jesus is the only way to God, you will offend all sorts of non-Christians – and even some wimpy Christians. -If you say we are all sinners who deserve eternal punishment, you will offend those who don’t believe this way. -If you say the Bible is God’s full written revelation to mankind, you will offend those from other religions or no religion. -If you say there is such a thing as absolute truth, you will offend the relativists. The list goes on and on. It is impossible not to offend some people if you take a stand for biblical truth and morality in the public square. And there is nothing new about this. It has always been the case. Whenever God’s people have stood up and proclaimed God’s truth, offence has been taken – big time. In both Testaments we see over and over again how God’s spokesmen were hated, rejected and opposed by others. You see, they took offence at the message being proclaimed. Let me offer just one Old Testament passage here: “To whom can I speak and give warning? Who will listen to me? Their ears are closed so they cannot hear. The word of the Lord is offensive to them, they find no pleasure in it” (Jeremiah 6:10). Anyone not in loving submission to God will of course find his word to be offensive. They will hate it and reject it, and those who proclaim it. It has always been that way. And things are no different in New Testament times. One simply cannot read the Gospels and notice how often Jesus caused offence. Everywhere he went he got people angry, he offended people, he divided people, and he caused an uproar. Yet today’s evanjellyfish think that all of this is taboo – we must not offend anyone or do or say anything to put people offside. We must just smile a lot and never say anything which might be deemed offensive, intolerant, judgmental or controversial. Did you get that? Jesus offended people. He divided people. He caused many to turn away from him. And yet he was the most loving, gracious, meek and humble man to walk the planet. If such a person could not help but offend many, then how in the world do we think that we can avoid causing offence? Of course the gospel message is deeply offensive. All those who live for self and sin will be offended by the gospel. That is natural. For example Paul says in 1 Corinthians 1:18-25 that the gospel message gives offence. As he writes in v 23: “but we preach Christ crucified: a stumbling block [or offence] to Jews and foolishness to Gentiles”. Given all this, it makes perfect sense to hear John writing these words: “Do not be surprised, brethren, if the world hates you” (1 John 3:13). Of course it will hate us – how can it do otherwise? To vainly imagine we can live a genuine Christian life and yet never offend anyone or get anyone bent out of shape is a pipedream. It just ain’t gonna happen. Now, to say all this must not be misconstrued. Am I saying we should go around deliberately seeking to offend people? No. Am I saying we should delight in picking fights and getting people upset? No. Am I saying it is a good thing to be ornery, cantankerous and belligerent? No. But we are to contend for the gospel, without seeking to be contentious. We are to fight for the faith, without seeking to be pugilistic. We are to argue our case, without seeking to be argumentative. But remember how the most graceful and loving man to ever live fared as he sought to proclaim truth. 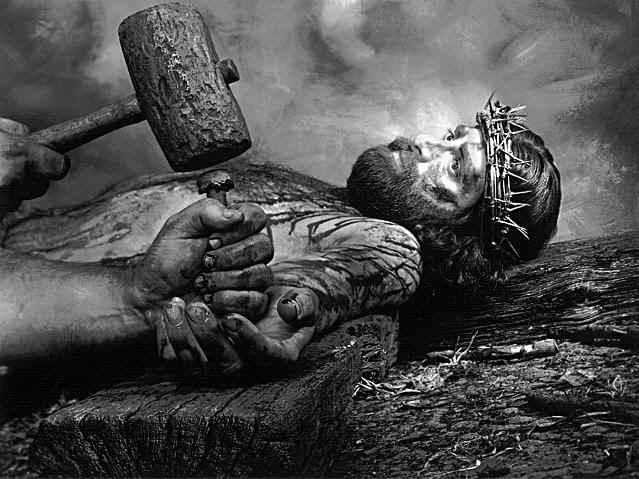 People hated him for it, and they eventually crucified him. Amen and amen. So I ask you again: Have you offended anyone lately? I have given a considerable amount of thought to the demise of the Anglo-Catholic and the article written by Fr Christopher Phillips to fill in the gaps. That blog died because it had no further purpose. Its purpose evolved in a way with which I could not agree, so I was the first significant contributor to take the exit door. There was a Cistercian monk who wrote frequently, and he seems to have disappeared. With the decisions by Fr Phillips and Deborah Gyapong to go, that was it. Christian Campbell himself set up a new and unrelated blog in which he discusses the things that interest him. I can only applaud this effort and wish him well. … Until now, I have been prepared to take a lot of flak out of a sense of human solidarity. I joined the TAC in 2005 by writing to Archbishop Hepworth, and he had the kindness to believe that irregularities and difficulties could be redeemed and corrected. I was staunchly loyal to him for nearly seven years. He was a respected Archbishop and Primate until September 2011. Another thing not to be forgotten is that we are both sailors – other people’s lives come first. You always go to the assistance of someone in difficulty or danger. Incivility exists at sea, but I have only found that with one professional fisherman who despised people who mess about in boats for pleasure. The man was tragically lost at sea last May! I believe in the law of Karma. You get what you gave – cause and effect. I have to admit that some things just don’t add up, but I am still grateful to him for having given me an ecclesial vocation to my priesthood for seven years. Now I have only to ask for moderation in our way of talking about him, and I am hated and shot with venom. At best I pass for someone as “deceitful” as the Archbishop, guilt by association. I have read a number of comments on Fr Smuts’ blog to that effect. We are in France in 1944 – resistants getting even with collaborators. Woe betide the young girl who had an affair with a German soldier! Where is the forgiveness and desire to put the past behind us and rebuild? Archbishop Hepworth has never done anything bad to me personally, and I have no way of being able to pronounce on the soundness of his decision to allow harrowing events in his personal life to hit the news. I might suspect this or that, but I have no evidence. From my own point of view, I followed him as far as possible, but can no longer do so. That has caused me a considerable amount of pain, but life has to go on. You can only leave the drowned sailor in the sea and make your own way to survival! In early 2012, Archbishop Prakash wrote a kind letter to me saying that I was not forgotten, and that I was still under proper jurisdiction as a priest. The TAC is only the shadow of what it was in October 2007, because it engaged on an illusory trajectory of asking Rome for something already requested in the 1990’s by Church of England clergy. The remnant is difficult to quantify apart from the bishops who participated in a meeting last March in South Africa. Communications are rare, Canada being the least taciturn with the monthly bulletins. The Australians merely have a directory of clergy and parishes, and we still await a new English website to give news and inform the world what’s left. I express my own position clearly. I am not (and have not been) involved in any conspiracies, but at the same time I am not sure about staying indefinitely in the TAC if I know next to nothing about whether it amounts to very much in any part of the world anything like near where I live. I am still dismayed about the US bishops and how they handled the old Patrimony of the Primate, not to speak of the debacle of that neo-baroque church in California. At the same time, if the TAC is a “feeding tank” of stragglers for the Ordinariate, no stable consolidation is possible for those who are opposed to the RC Church for doctrinal reasons or are unsatisfied with the implementation of Anglicanorum coetibus, notably the rigorist application of the principle that on one who has ever been a Roman Catholic will be admitted to the clergy, and without any consideration of any mitigating circumstances. There must be a parting of the ways, but in a Christian way, not like angry people killing each other just after the Armistice. The obvious solution would be for the TAC to continue in Africa and India and be folded up elsewhere, asking bishops of other churches to have the kindness to take in the shipwrecked by recognising some validity of their previous Christian lives or priestly ministry. At this point, I am forced to recognise the total sterility of any further discussion of the TAC and the implementation of Anglicanorum coetibus – not only on my own blog, but also in Fr Smuts’ postings and the comments on these subjects. It is unhealthy, even addictive in a certain sense, and can lead only to loss of faith, if not in God, at least in the institutional church. I have questioned my own vocation for a considerable length of time, and am increasingly alienated by the Church every time I am physically confronted with its reality. I have found the same thing in my experience of stays in the guest house of a monastery. Am I under the influence of evil spirits or someone having almost achieved what Jung called individuation? I won’t find the answers on the Internet. My real vocation was the sea, am I can probably do something about it to a very limited extent. The contemplative life at sea is not without precedent – St Brendan! What conclusion can I offer? Perhaps I can offer a little advice. Don’t look for relief to our spiritual agony on the Internet any more than in our mailboxes. Don’t wait for Godot, because Godot will never come. We have to go to Godot and our destiny is in our own hands. Many of us will never find resolution in this life and death will come all too soon, the loose ends remaining loose. Wherefore unsatisfied soul? and Whither O mocking life? – as I quoted in another context. We are at the same time our own best friends and worst enemies. We are full of the same contradictions as we find in others, and this is why we often over-react by “projection”. I see that with the “trolls” who are as rude and callous on the Internet as they are in their cars blasting their horns and tail-gating. And when we hit rock-bottom, and all the rubble gets cleared away, we may discover the meaning of Original Sin, the Redemption and the real Christ. That is our faith and hope in the darkness and the desert. Let us pray for each other. That is the least we can do. There’s also a question on the TAC on the blog Foolishness to the world – although I see no problem myself. And the (Ordinariate) formation for of the former Canadian Anglican clergy, is to begin in Advent of 2012. Gapyeong, South Korea — The Rev. Sun Myung Moon, the self-proclaimed messiah who turned his Unification Church into a worldwide religious movement and befriended North Korean leaders as well as U.S. presidents, has died, church officials said Sunday. He was 92.